My curiosity has been piqued lately. Want to chase a few wild geese with me? 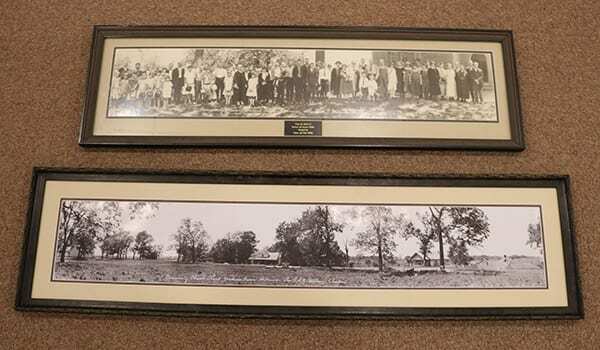 J. C. Hawkins’ 1925 panoramic photos recently brought in by Rev. John E. King on behalf of the Administrative Commission for Walnut Grove Presbyterian Church. Who was John C. Hawkins? Through an Internet search I learned that in 1909 he founded the Clipless Paper Fastener Company in Newton. While he’s listed as a manufacturer of paper fasteners in the 1920 census, by 1930 he’s a hotel manager. The executive director of the Jasper County Historical Museum in Newton kindly sent a scan from A Century of Industrial Progress in Newton, Iowa, which notes that Hawkins’ company went into receivership and was purchased in 1925. So perhaps he picked up a camera as a way to earn a bit of money. Neither the director nor a county historian knew of Hawkins’ photographic activities, but now they’re intrigued as well. Perhaps they’ll chase that wild goose for me. 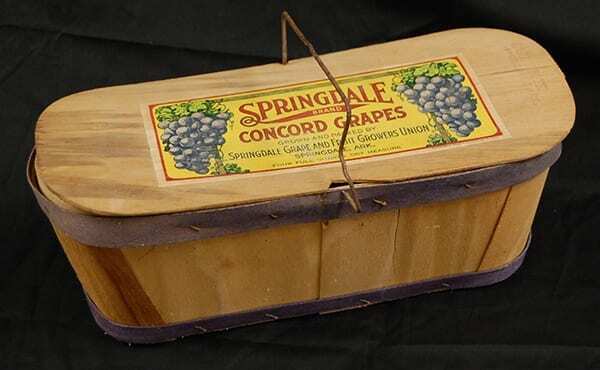 According to an article in the April 29, 1937, edition of the Springdale News, “The baskets provided for mailing were filled with choice Concords and bore the label of the grape associations. . . .” Even more grape baskets were sent in 1926. So I got to thinking, what if our grape basket is one of the festival baskets? The label from the Springdale Grape and Fruit Growers Union has a 1920s vibe about it. Most of the grapes grown in the Springdale area were sent by truck or rail to the Welch Grape Juice plant in bushel baskets or crates. The history of this basket will remain a mystery until a grape festival basket with its shipping label appears one day or we find an image showing the baskets prepared for mailing. Curious to know if there was a record of the president receiving this gift, I contacted the Calvin Coolidge Presidential Library and Museum in Massachusetts. The archivist there graciously checked the photos and scrapbooks in their collection, but nothing turned up. A check with a manuscript reference librarian at the Library of Congress, which has a Coolidge Papers collection, was also negative as Coolidge destroyed most of his personal papers before his death. I think the fate of the grape box and the president’s thoughts about it will remain mysteries. But there’s no mystery as to why a box was sent to Premier Mussolini of Italy. The Italian immigrant community of Tontitown supplied tons of grapes to the Welch plant over the years. Wild Goose #4. 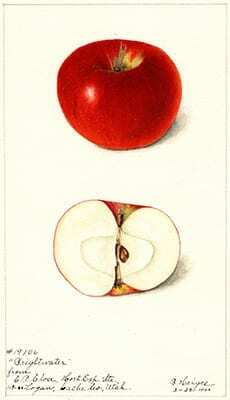 When I attended a recent event at Brightwater, Northwest Arkansas Community College’s new culinary school in Bentonville, I heard one of the staff members say that the apple for which the school is named is extinct. Curious to learn more, I contacted Guy Ames of Ames Orchard & Nursery in Fayetteville. Guy’s a passionate plantsman who’s been growing fruits and fruit plants adapted to Ozark conditions since 1983, including several Arkansas heirloom apples. He put me in touch with Scott Gothard in Amorel (Mississippi County). Equally passionate, Scott’s hobby is collecting and growing every Arkansas apple he can find. Both men searched their reference books and contacted friends in the field in an effort to find Brightwater. So, four questions, zero answers. That’s the problem with a wild goose chase—sometimes you run into a dead-end or the search is greater than what you have time for. But the interesting bits of history that you learn and the generous, helpful people you meet along the way sure are fun. My grateful thanks to everyone who took the time to answer my questions. There are a number of marvelous turn-of-the-20th-century images of Arkansas fruit in the USDA Pomological Watercolor Collection. 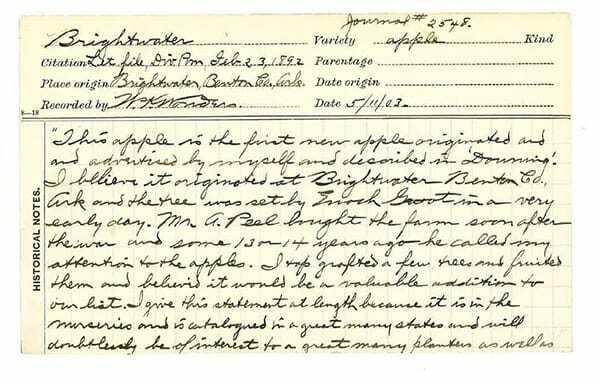 The National Agricultural Library is in the process of digitizing their American catalogs in the Henry G. Gilbert Nursery and Seed Trade Catalog Collection. As of February 2017 they had over 26,000 catalogs digitized! Marie Demeroukas is the Shiloh Museum’s photo archivist/research librarian.